The view of this foundry mark is taken at a severe angle because the straight on view is blocked by a pipe. The bottom line locates John Lawson's Eagle Iron Foundry on Bedford Ave. at the corner of North 13th St., Brooklyn. This address was recorded as 81-85 Bedford Ave., corner of N. 13th St. in Brooklyn city directories from 1889 to 1899. The following quoted from The Brooklyn Daily Eagle, 3 Aug. 1888, page 4, identifies John Larsen as owner, "A fire occurred in the one story frame iron foundry, 85 and 87 Bedford avenue, at 10:30 o'clock last night and completely gutted it. The loss on building, stock and machinery, which were owned by John Larsen, was $1,500. The origin of the fire is unknown." 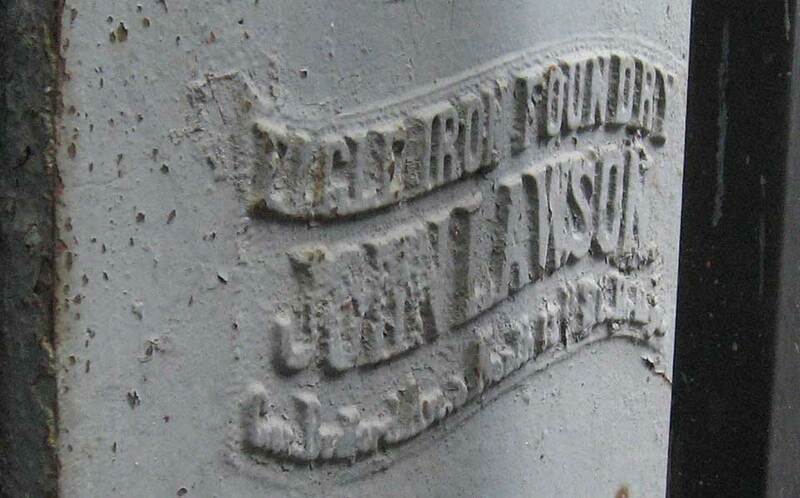 This John Larsen seems to be the same as the John Lawson on the foundry mark, the Swedish form being Americanized to Lawson. According to emails from Svea Bogue, a relative, Lawson was born 16 June 1852 in Stokholm, Sweden, and died 18 Feb. 1910 in Brooklyn, N. Y. John Lawson appeared in the Brooklyn Census of 1892, age 41, born Sweden, and appeared in the 1900 U. S. Census, living at 160 Bergen St., Brooklyn, age 47, born June 1852 Sweden, immigrated 1884, still a non-citizen, whose occupation was recorded as "Iron Worker." The O'Leary/Lindberg family tree on ancestry.com records substantially the same information. It is not clear for what period of time Lawson was proprietor of the Eagle Iron Foundry. Both earlier and later ads for a Eagle Iron Works identify Jacob May as owner. Certainly by 1891, when this ad appeared in a Brooklyn directory, the proprietor was Jacob May. For the history of Jacob May and his Eagle Iron Works with offices on DeKalb Ave., see Eagle-Brooklyn.htm.